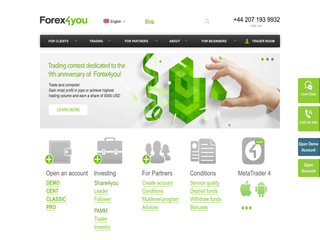 Forex4you is an innovative brokerage, owned by E-Global Trade & Finance Group, Inc. The office of operations finds its location on the British Virgin Islands. The brand’s key goal revolves around creating an opportunity for every client to immerse himself in the Forex market. He can do that by incepting a Cent account, acquainting himself with the nitty-gritties of trading. The trader can then proceed to launching a Classic account to commence piling up cash and polishing his skills. After having obtained considerable experience, he can eventually move to a Pro account where he will have the chance to testify the knowledge. Nowadays, Forex4you is proud to provide professional, high-tech services to all of its customers. Making Forex trading affordable even for small investors. Making trading of foreign currencies accessible to everybody via the Internet. The “4” in the name reflects the company’s web focus, while the “you” is geared towards you, the customer, getting affordable Forex. Forex4you is regulated and authorised, following the Securities and Investment Business Act, and is in existence since 2007. Since then, the FX entity has grown to one of the gargantuans in the niche, offering a gigantic assortment of features, accounts, and perks. Next to a demonstration account, which is excellent for new-fangled investors, there are five (5) types of accounts. These include Cent accounts, Classic Accounts, and Pro accounts, as well as two types of PAMM – PAMM Trader accounts and PAMM Investor accounts. Getting a grasp of FX trading is best through a Cent account. However, it’s also suitable for seasoned traders who’d love to testify new advisors, indicators, and strategies. At Forex4you, you have a Cent account (Instant execution) and a Cent NDD account (Market execution). The latter also gets a no-dealing-desk trading. Both of these accounts are swap-free, with a minimum lot of 0.01 (0.0001), a maximum lot of 1,000 (10), and a leverage ranging from 10:1 to 1,000:1. The Margin Call and Stop Out levels are 50% and 10%, respectively. The Classic (Instant execution) and Classic NDD (Market execution) are the most popular Forex4you accounts. The leverage ranges from 10:1 to 1,000:1, the minimum and maximum lots are 0.01 and 200, respectively, and the Margin Call and Stop Out Levels are 100% and 20%. However, both of them are NOT swap-free. The Pro STP account is with a market execution whose supersonic speed is 0.21 seconds on average. The leverage for this account varies from 10:1 to 200:1. The account is NOT swap-free, and the minimum and maximum lots are 0.01 and 200. The Pro STP account’s Margin Call and Stop Out levels are 100% and 20%. The PAMM Trader account is characterised by an instant order execution, with requotes. The maximum and minimum lots are 10 and 0.01, the leverage is in the range 10:1 to 500:1, while the Margin Call and Stop Out levels are 50% and 20%. For a PAMM Investor account, the calculation finds its basis on a high watermark, defined performance fee, and equity. Hustling on the Forex market is quite daunting a task alone. Thus, selecting a secure brokerage, like Forex4you, saves you from the anxiety to worry about the security of your funds. The company is truly devoted to guaranteeing that traders can derive benefit from a secure and stress-free trading environment. The British Virgin Islands’ Financial Services Commission (FSC) is licenced and authorised to stringently monitor Forex4you’s activities. Under SIBA regulation, the FSC also adheres to common standards and international best practices by international entities, such as the International Organization of Securities Commissions and the IMF. We all dislike having issues while trading. This is where the impeccable support service of Forex4you comes to the rescue. Next to several phone lines all around the globe, there is a live help, as well as an e-mail assistance all provided with the utmost attentiveness and professionalism. A thing that really distinguishes this Forex broker from the others is the option “Call via site” that’s on the left of your screen. It is quite handy and completely free. The elegant website comes in English, Croatian, German, Spanish, French, Hindi, Indonesian, Vietnamese, Chinese, Cantonese, Italian, Malay, Thai, and Russian. Electronic Payment Systems (FasaPay, Skrill, WebMoney, and NETELLER). Bank wires necessitate 1-3 working days, while all other options are instant. Depositing via FasaPay, Skrill and NETELLER is entirely gratuitous, while all other deposit methods require a certain fee. Withdrawals at the Forex brokerage Forex4you are via Bank Wire Transfers and Bank Cards (VISA, MasterCard), as well as through Electronic Payment Systems, such as Skrill, WebMoney, FasaPay, and NETELLER. The latter withdrawal methods are instantly executed while bank card and bank wire withdrawals need 2-6 business days. The currencies available at the Forex broker are USD, EUR, CHF, and IDR. Forex4you might not be equipped with throngs of promotions and perks, but there is one bonus programme that’s really worth reviewing. It ranges from 5% to 25% and hinges on your choice. However, remember that to qualify for a higher bonus percentage, you should engage in more trades. Additionally, you won’t be able to trade or withdraw the bonus till you have arrived at the trading target and no more than 5 bonuses are available at any time.